Up until recently, I hadn't ever given much thought to flat iron steaks. Actually, until 2002, the only though any butcher had given to this cut of meat was how quickly they could get it into the grinder. The flat iron steak (also known as top blade steak) was "developed" in 2002 by two researchers at the Universities of Nebraska and Florida (what a job, huh?). When I say "developed", I mean that these guys realized that this meat that was usually turned into hamburger could actually be cut in a way that made it a delicious steak. Fast-forward to 2010 and this steak is now the fifth most popular cuts of steak, and one of the most economical. Some even think it has a better taste than more expensive cuts like the New York Strip. Count me as one of those flat iron steak fans. So it was "developed" in 2002, but I didn't really develop and interest until they went on sale at my grocery store 2 weeks ago. Now in the last 10 days, I have grilled 4 of them. Yep, the quickest way to my grill (and stomach) is via my grocery store's weekly ad. Now that I have a few flat irons under my belt (both figuratively and literally), I feel like I have been missing a great cut of meat. Like many other cuts of steak, your job is to not screw it up, cook it just right and let the natural beefy goodness come through. The flat iron steak should not be cooked past medium temperature or it will get a little tough. It's best at medium-rare. I admit, I let a few of the steaks sit in a little Worcestershire sauce, and it was delicious but not too overpowering. Most of the time, fresh ground pepper is all you need. Let's get right to it. 1As always when grilling steak, it is important to allow the meat to warm up before we throw it on the grill so that it cooks evenly. Allow your flat iron steak to sit on the kitchen counter for around 30 - 45 minutes prior to grilling. This is a good time to rub it down with the pepper and if desired, let it sit in just enough Worcestershire sauce to cover the bottom of the plate. If using the sauce, flip it once after about 20 minutes. 2While our steak is warming, let's get the grill going. 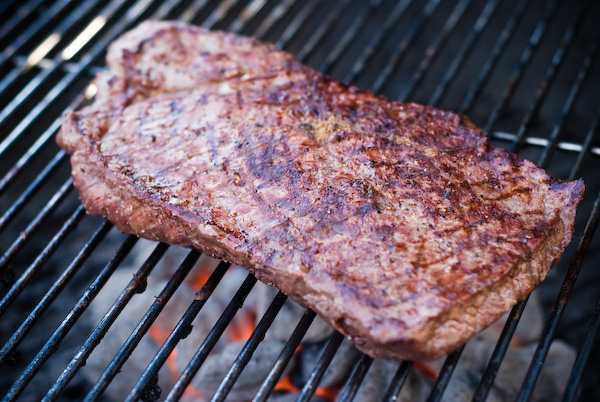 We want around medium - high direct heat for this steak, so pile the coals to one side of the grill so that they are about 3 inches from the bottom of the grate. If using a gas grill, turn the knob to medium high and light it (you gas people sure do have it easy). 3I repeat this on every steak post, these times are just guidelines and every grill is different. Always err on the side of rare when grilling a steak. You can always throw it back on the grill! Now then...Once the flat iron steaks have warmed up to around room temperature, it's time to grill. Place the steak over the hottest part of your medium-high grill (check by placing your hand about 2 inches above the grate). 4Cook the flat iron steak for about 4 minutes (lift one side carefully to check your grill marks), then rotate 45 degrees to create those nice crosshatch grill marks. 5Cook for another 2 - 3 minutes after rotating (again, times vary, we just want a nice seared crust like shown in the photo above). 6Now using tongs (NEVER puncture your steak), flip the steaks over to the other side. 7Repeat the process on this side of the steak, cook for 3 - 4 minutes, rotate, cook for another 2 - 3 minutes. 8Remove from the grill and place on a platter, but let it sit for about 5 minutes before you cut into the flat iron steak to let the juices re-distribute. 9Most flat iron steaks have a line of gristle running right down the middle. Some people like to slice the flat iron into two separate steaks to avoid this tough meat. It's up to you. 10Slice the steak thinly against the grain and serve. So check your local grocery store or butcher for this (relatively) recent discovery from our friend the cow. If they don't know what you are talking about, ask for a "top blade" steak. If they still have no clue, well, then they don't have a clue and I would question buying any kind of meat from that store. It's not a rare cut of meat anymore, so they should know what you are talking about. Omg this was amazing! I’m always so worried and over cook steak, but not this time. Followed the directions exactly and it came out perfect. I had mine sitting in a lemongrass/ginger marinade for almost a day. I wish it wasn’t gone!! Thanks for the help, worked out just like you said. I did take the steak off the grill, cut it into thick strips, put it back on until the little cutlets that were med rare and it was perfect! Used real Briquettes and Hickory Chips to smoke it a little…what a great cut of meat the Flat Iron is, thanks again for your help! Wife got flatiron steaks. Wasn’t sure hot to grill them. Followed your instructions and they were PERFECT. Thank you! Never grilled flat iron until now and had to find a recipe. Glad I happened upon this one first! The Worcestershire made the greatest marinade, brought out the taste of the beef! Following this recipe again tonight and my tummy is just rumbling knowing how good the steak is going to taste! Thanks! Prepared just as you instructed…absolutely incredible! 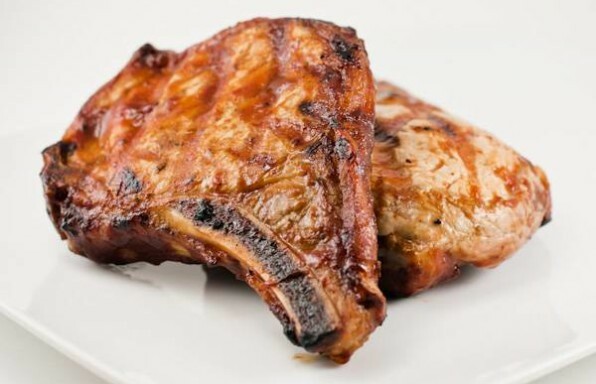 So tender, juicy and flavorful! I have a new 2nd favorite steak! Thanks for your experimentation! First time I ever grilled flatiron steak was last night – my wife brought it home for me to cook for our guests – no pressure. But I followed your advice – it was excellent and I basked in the glow of post BBQ success for the rest of the evening! Cheers Steve and Tom – great site btw! Great techniques and yes, the steak turned out as you said it would! My grill has a thermometer and I started it at 425 which I think was too high. I turned it at 5 minutes and it seemed a bit dark. So I flipped it and only left it on the second side for about a minute and a half. It was cooked to almost medium, but still delicious! Would you recommend lower heat or less time? Great recipe!! Cooked it exactly how you said to cook it and it turned out phenomenal!! I followed your directions completely, with the exception of the Worcestershire sauce. It turned out perfectly! We’ve got a living room full of stuffed and happy people. A friend of mine was just talking about flat iron steak and raving about it. I was at my grocery store and saw it on sale so decided to try it. But I wanted to find a good recipe. You are my hero!! I made this steak tonight and it was fabulous!! I have a tendency to overcook steak because I’m always afraid of it not being cooked thoroughly…and I have to admit, I cut into the steak while it’s on the grill to check for doneness. Not this time! I followed your recipe sans Worcestershire , just pepper and kosher salt. I am a nerd and timed it exactly to your specifications. When I took it off the grill, I poured clarified butter with freshly minced garlic on it and waited 5 minutes to let it settle. It was so good! I am now a fabulous steak chef! I’m so proud of myself. Thank you so much! !